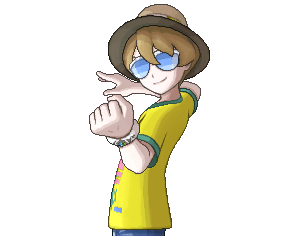 Unlike most of the trainers you’ll come across in the Battle Tree, Dexio has no specialty. His Pokemon are spread across different types, making it quite hard to predict what Dexio’s line up would be. However, Dexio has some repeats such as using two Psychic type Pokemon. Dexio can be fought randomly as the 10th Super Singles battle at the Battle Tree. Dexio’s team has a varied set of Pokemon but bringing a Dark Type won’t hurt to counter the two Psychic Pokemon in his team. He also has two Fairy Type Pokemon which you might want to counter also using Steel or Poison type attacks. Bringing a wall-type Pokemon like Blissey or Chansey might give you time to whittle them down slowly save for when he brings out Passimian, his Fighting Type Pokemon. If looking for possible Pokemon that would shine here, one would possibly be Honchkrow to check his Passimian, Espeon, Whimsicott, and Slowbro. However, watch out for the Ninetales (Alola) as it can use Ice Type moves to bring down your Honchkrow so bringing either a Fire or Fighting type to counter her would be good.